Friends, friends, take another look post 5300. I've already referred you to this! Maddening, isn't it? But if you would only (big sigh) pay careful attention to what Ivy says then your posts would soon go down the page and you wouldn't see it any more. Inattentive lot, you are. One question:is this harbour located on a river? And Ivy,don't hesitate to give us a REAL clue. Ivy, I sailed here but it was years (and years) ago.I remember a village where I had a delightful meal in "stared" restaurant.Since Ralf is a distinguished gourmet maybe it could be Bucklers Hard? Spot on, Yves. I'll tell you more about it tomorrow as, although a tiny village, it has a great history. But when I mentioned Ralf I was thinking of Beaulieu, 2 or 3 miles up-river and where I lived for a few years late '50's to early 60's and where Lord Montagu has his famous motor museum. There would be untold delights in there for Ralf to enjoy inspecting. 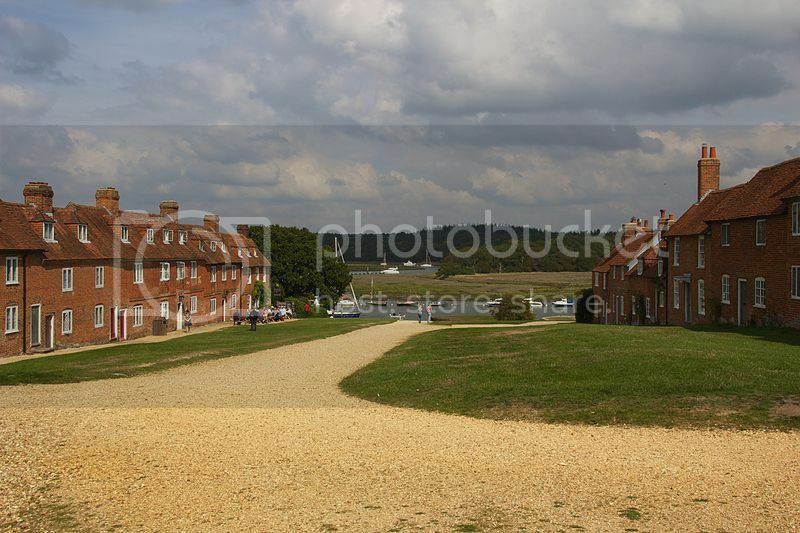 This is Buckler's Hard itself. It may bring back memories for you, Yves. The Hard is famous for having built Nelson's warship Agamemnon, see http://www.bucklershard.co.uk/ which will give puzzlers an overall idea of the area, but how different from when I knew it. Then it was just as in the picture above, now there is a river cruise (!) a woodland trail (it always amazes me how people are led through woodlands as if unable to wander for themselves. Conservation reasons, I suppose, i.e. look but don't touch). There is even a tearoom with admissions. Admissions????? Do you mean you have to pay to wander down the street and look at the river????? Anyway, over to Yves for our next excursion. Well, i have checked this place on Google Earth, but was to quick and went on... With a closer look i would have fould a very similar picture. Thank you for showing me this museum. Nice collection. Very British. Yes Ivy I remember it well.Beaulieu river is a nice place for sailing even though it was already crowded in the high season in the 80's. And when you are a French speaker it is very handy to know you prononce it "Bioulee"! Somewhere in North West France? Yves, on the web page I quoted, there is a picture further down the page under Wall of Fame, showing carelettes. I found other picures of these showing large nets suspended from the seaward side and in fact one view had a carelette on the cliff just below the church, but am puzzled as to what they were catching? The area is apparently famous for its oysters, but I don't see that it would be for that! I am not a specialist in fishing.But I had chats with people who own carrelets.It depends on the season, the more common species are grey mullets,sole,eels,and a kind of white shrimp (paleamon longirostris,it seems). 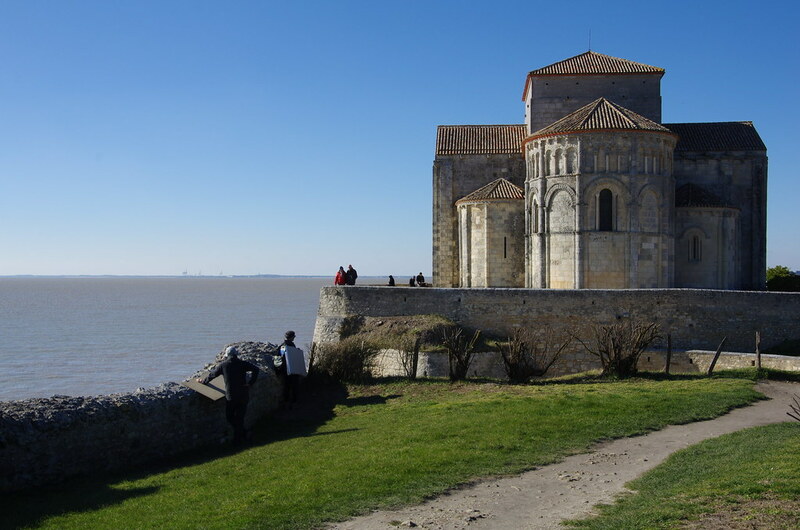 Well done Ivy.Sainte Radegonde de Talmont it is.A good exemple of the roman saintongeais.I was there last week and I will post pictures of this pretty area. In French but with pictures. Yves, I forgot to refresh before posting my comment, so can you clarify for me? I was just lucky that the picture came up early in my search. Looking at other pics. of the area, it seems very charming so I look forward to seeing your photos. But I must catch up with your other travel accounts, as well as those of Ralf. I have been somewhat preoccupied one way or another recently and am terribly behind with all the explorations. Must get going!
. I have been somewhat preoccupied one way or another recently and am terribly behind with all the explorations. Nothing serious I hope Ivy. Too many goodbyes, Yves, five over a period of a few weeks Nov./Dec. '14 incuding one of a very dear friend and now I have another whose chemo. has not helped and it is inoperable. My newish neighbour has moved, she was a bit of a free spirit and we got on so well. She loved her little house and looked like staying there for good, I was so pleased, but she has had to move away for family reasons. She said she'd cried and cried but had to go. Next week I go for a check-up to see if recent eye injections are doing any good, will probably have to have more. Heigh-ho, not a happy bunny, as we say. A happier bunny now - the check-up revealed success for the eye injections. General partial deterioration will continue but at a slow pace and the acute problem has been solved. Monthly checks will carry on ad infinitum but it was caught in time to avoid serious damage to the retina. So nice to have good news Ivy.